New wares offerings from Airsoft Atlanta include many aftermarket products never before seen in the USA. Airsoft Atlanta is one of the largest suppliers of repair and custom gun parts for airsoft rifles in North America. Many new product lines are already in stock, along with more on their way before the Christmas Season begins. Specialty gun parts from China, Taiwan, and Japan are all new and of vital interest to airsoft gun enthusiasts. Many new aftermarket airsoft parts from Japan, China, and Taiwan are available at Airsoft Atlanta this autumn season. Airsoft Atlanta, being a specialty retail store of airsoft custom parts and guns, has expanded their product line offerings with a bunch of new manufacturers for various rifles and guns. PPS Airsoft is a new product line featuring parts for both airsoft gearboxes, sniper rifle upgrade parts, and airsoft grenades from China. PPS features cnc machined precision steel and aluminum parts that work flawlessly with many airsoft guns in the market. Their gearbox parts are perfect for version 2 and version 3 style AEG guns. Airsoft players that happen to be snipers will also appreciate the new custom parts for their guns. The SVD upgrade parts are awesome for players with this unique rifle setup. "We've never seen high quality upgrade parts for the SVD before," says Eric Barnes, salesperson at Airsoft Atlanta. "The engineering that went into these parts is top quality, something we're excited to be selling at our store." 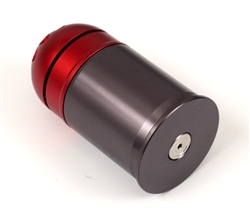 New custom SVD parts include piston and piston head components, with more future parts in production. PPS has also developed a new type of gas powered airsoft grenade for use in M203 style launchers. Unlike other previous brands, the new PPS grenade system is precision made for the rigors of the battlefield. The loading is simple and clean, compared to other brands. The primer reset button is very easy to use, along with the fact it's automatic, is a blessing for airsoft players. Players will be happy to have new airsoft grenades that don't cause issues on the field. Airsoft Atlanta is proud to announce the PPS lineup, along with other new parts from Taiwan and Japan that are due to arrive any week now. Japan has been making lots of new parts, including Nine Ball, Prometheus, and Laylax. Airsoft Atlanta will be stocking all the new Japanese gear as of this October. Airsoft Atlanta's website has a display of all the new products that are available. Airsoft Atlanta is a highly experienced pro-shop company that offers airsoft guns and ammunition to government agencies and consumer players of the sport. Their website offers a selection of guns and expertise that is perfect for any budget. Attention and care are given to all orders and recommendations based on past experiences for airsoft usage. Airsoft Atlanta is the leader in online airsoft sales, with a large showroom in Georgia, and a website specializing in airsoft parts, airsoft guns, and tactical gear.